When I reviewed the 1998 remake (or is it reboot?) I mentioned that I was a fairly devout Godzilla fan as a kid. Still, I admit that I was only really a fan of the sequels. I loved to watch Godzilla fight other monsters and comically destroy cities. I didn’t see the original film until much later on and I was initially put off by it. 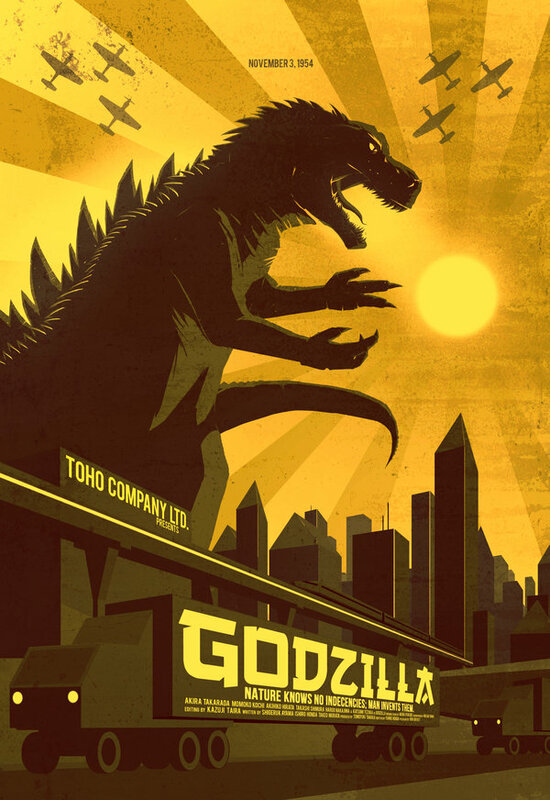 It was slower paced, there were no other giant monsters for Godzilla to fight, and the whole movie felt too grim. I dismissed it for many years. Having recently rewatched it, though, I see what a masterpiece it truly is. It’s difficult now-a-days to treat giant monster movies seriously. No one, it seems, not even those who make them, honestly wants to make great films for the genre. They’re about action. They’re about special effects. They’re about how cool the monsters look. They don’t exist for story telling purposes*. Most are glorified sporting matches, a football game with more monstrous contenders. Not so with the 1954 Gojira (Godzilla was an American mistranslation that stuck.) Here is a movie that is about ideas, not merely action. The grimness that I found so off putting years earlier is quite intentional—this film is about war and nuclear annihilation, albeit through the imagery of a giant destructive dinosaur. Japan, of course, had experienced the destruction of the atomic bomb less than a decade earlier, and so many scenes in the film allude to it. A city on fire, countless buildings collapsing, hospitals overflowing with the injured and dying, the military fighting a losing battle against an unstoppable force, a secret weapon (the oxygen destroyer) that could end a war but might fall into the wrong hands. The imagery is powerful, even overwhelming at times. One scene shows school children singing a prayer, a desperate cry for salvation, the kind of thing that could very well have happened after Nagasaki or Hiroshima were bombed. It may be one of the saddest moments ever filmed. It’s easy to be caught up in moments like this in the film and forget that they were caused by a clumsy man in a rubber suit. Admittedly, the special effects aren’t great. At no point does Godzilla look real or believable; he looks like what he is: cheap foreign effects from fifty years ago, and still I find myself involved. Maybe its because the film takes him so seriously. A shot of Godzilla standing in the middle of a miniature city in flames should’ve seemed comical, and yet I found myself feeling disheartened over the destruction. People aren’t supposed to die in vast quantities in a giant monster movie, cities aren’t supposed to be on fire. This film dares you to care, plain and simple. I had once said that giant monster movies could never rise above B-movie grade. I think it’s time I retract that. The reality in film is that any subject can be made into an A-film, if only it’s done with sincerity and strong ideas. Too many films aim low and get low returns. Gojira could’ve easily done that. It could’ve just been another monster movie. But instead it aimed higher; it wanted to symbolize something. And that’s why, fifty-seven years after its release, people like me are still talking about it. *Cloverfield may be an exception, but I never saw it.